There are some fun things for children and young people or those just young at heart to do over the weekend apart from visiting gardens…. They have also invited Jackie Morris, St Davids’ famous artist and author to come along on both days and she is going to be reading some of her wonderful stories in their garden on Saturday and Sunday (please contact Jan & John for times on 07775 555305). At Penrhiw Priory on the edge of St Davids there will be an opportunity to be shown around the gardens and woodland grounds and in the next-door garden Melin Dan Y Rhiw just below Penrhiw Priory woodland, you can see the bees making use of the beehives belonging to Jenny and Gordon Tripp-Black in their old mill-house garden next to the river Alun. Award winning Dr Beynon’s Bug Farm, just outside St Davids, will have it’s walled garden open to explore and some details of it’s other attractions there are here. They have a whoppingly huge Bug Hotel there. A Gardeners’ Market will be in Cross Square on both days with plenty to look at and the award-winning Goodwick Community Brass Band will be playing on Saturday. 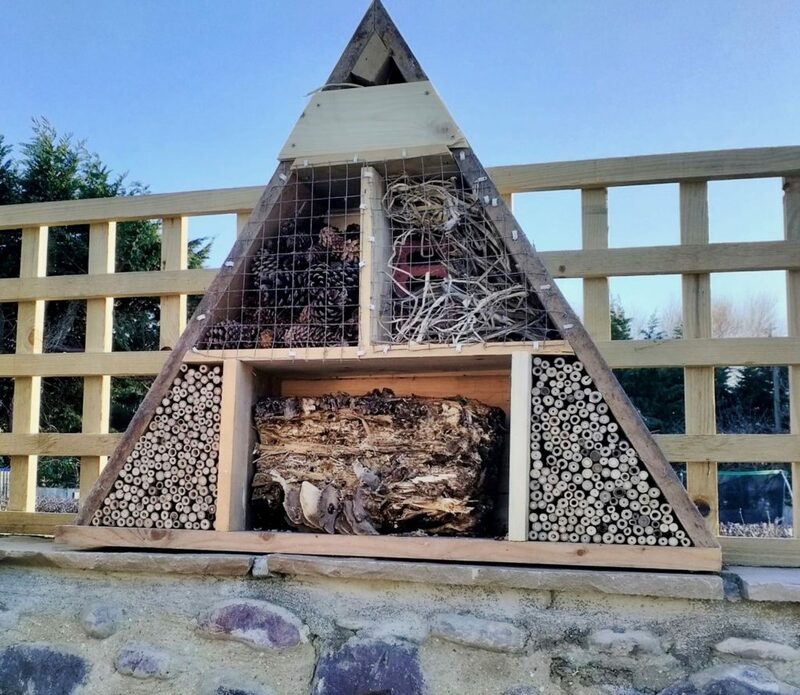 We are trying to persuade gardeners to encourage insects and birds into their gardens and some of the gardens you will visit over the weekend have been building bug hotels, so keep your eyes open for them. There is an enormous one at Dr Beynon’s Bug Farm and here is another stylish bug hotel.